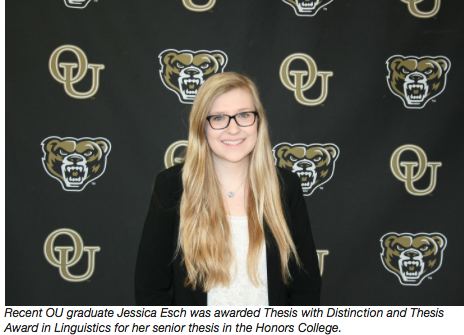 Honors College member and 2017 graduate Jessica Esch has been awarded Thesis with Distinction and Thesis Award in Linguistics for her senior thesis, a requirement for all Honors College students. 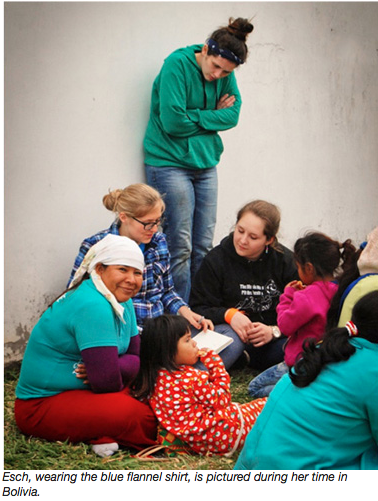 Esch spent a summer in Bolivia doing research for her thesis, studying language structures and generational language variety within Ayoré (eye-or- RAY), an indigenous group in Bolivia. She examined color and kinship terms within various generations and tested for differences among the generations. The results found were different than what she expected. Names for colors are sparsely used in Ayoréo (Eye-OR-ray-OH), the language of the Ayoré. They only had four basic colors: black, white, red and yellow, and any additional colors that could be seen had no name. Since many Ayoré are able to speak Spanish as well, they utilize Spanish color names to describe items if the name doesn’t exist in Ayoréo. She is grateful for the support that the Honors College and Dr. Graeme Harper, dean of the Honors College, have given her throughout the process of writing her thesis. One of the things she will miss most about being at OU is being a resident assistant for Oak View Hall, the Honors College dorm. Esch hopes to continue her education by getting a Ph.D., with the possibility of continuing her research as well. This entry was posted in Bolivia, Santa Cruz, Tourism and tagged Bolivian heritage, indigenous. Bookmark the permalink.